He charges throughout Indo, trains like a machine, and is vying for the first ever ISA World Adaptive Surfing Championship. Not bad for a guy with one leg. Mark “Mono” Stewart lost his right leg to osteosarcoma at just 15 years old. But they wouldn’t be called “adaptive athletes” if they didn’t do just that – adapt. Now in his early 50’s, Mark is chasing waves all over the world and hoping to capture the the first ever ISA World Adaptive Surfing Championships next month. 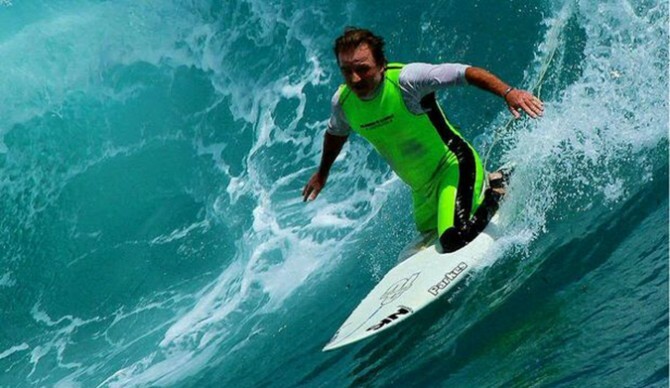 The Australian surfer has represented Queensland in three Australian surfing titles, so his odds of succeeding in an event reserved for adaptive athletes in September’s contest (and beyond) are pretty good. He’s even headed to Indonesia for three weeks specifically to train for the event being held in La Jolla, all to compliment his continued training at the Hurley Surfing Australia High Performance Centre. Not bad for a guy who’s spent most of his life riding waves as “Mono.” But beyond Stewart’s motivation to become the ISA’s first Adaptive Surfing World Champion, any success he reaches over the next month can and will only grow the profile of other amputee athletes. Amy Purdy loved snowboarding too much to let Neisseria meningitis slow her down. Mike Coots lost his leg in a battle with a shark then went on to become an inspirational photographer and advocate for protecting sharks. And of course Bethany Hamilton became one of the most inspirational athletes in the world by coming back from losing an arm in a shark attack of her own. All their challenges have done nothing but motivate others, so cheering on a guy like Mark “Mono” Stewart is another good drop in that ocean of positivity. His is definitely one story worth keeping an eye on. To learn more about the ISA Adaptive Surfing World Championship held September 24-27, Visit ISA Adaptive Surfing Info.